Kids, it’s your turn to take on Mud on the Mountain and play in the mud without getting in trouble with your parents! The course is based upon the highly-popular grown-up Mud On The Mountain as it shares many of the same obstacles, some scaled down versions of classic obstacles, and some new fun features! 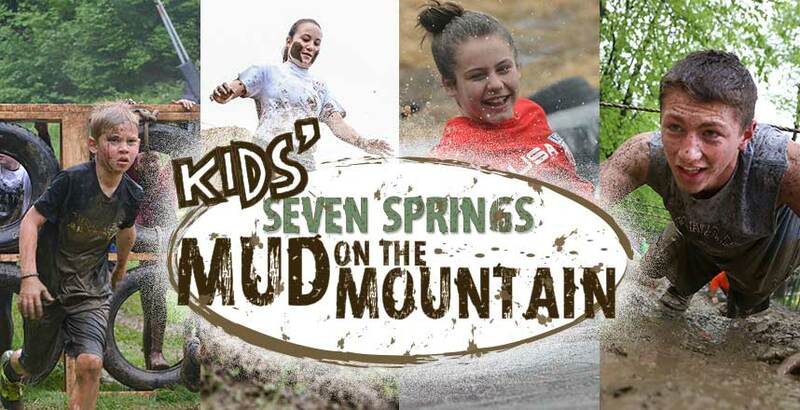 Kids’ Mud on the Mountain takes place on Saturday, May 25, 2019, the perfect event to kick off your summer vacation! Event Registration will close at 11:59 p.m. on THURSDAY, MAY 23, 2019, or when all spots are filled. There will be NO on-site event registration the day of the event! 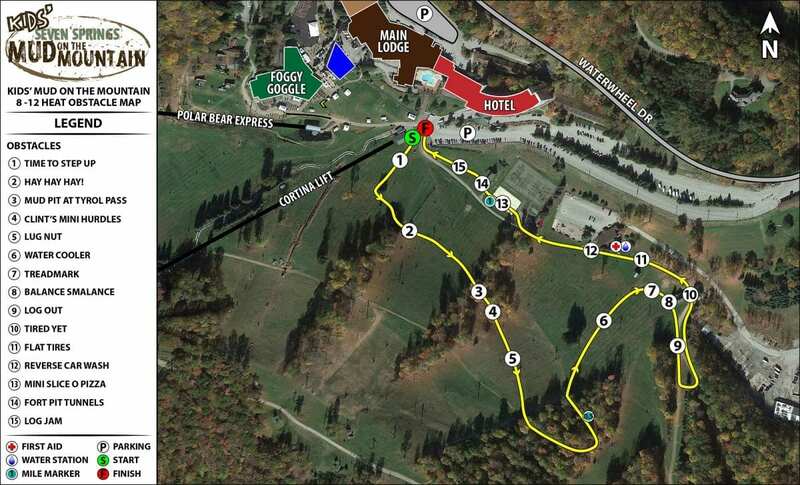 Packet pick up and bag check will take place starting in the Timberstone Room located on the top level of the Skier Services Building. Packet Pickup will be open on Friday, May 24 from 5-8 p.m. and on Saturday, May 25 at 7 a.m. The event is split into three divisions, which are divided by age. Each division will offer heat times. Please schedule your children and any groups together for the same heat if they want to run together. There are no prizes, just bragging rights and camaraderie with the runners in your heat. Each participant receives a wicking shirt and medal when they finish. Packet Pickup will be in the Timeberstone Room on Friday, May 24 from 5-8 p.m. and Saturday, May 25 beginning at 7 a.m. Bag check is in the Timberstone Room, located near the Ski Lodge and is available from 7 a.m. until 4 p.m. Check out the obstacles runners will encounter this year during Mud on the Mountain! 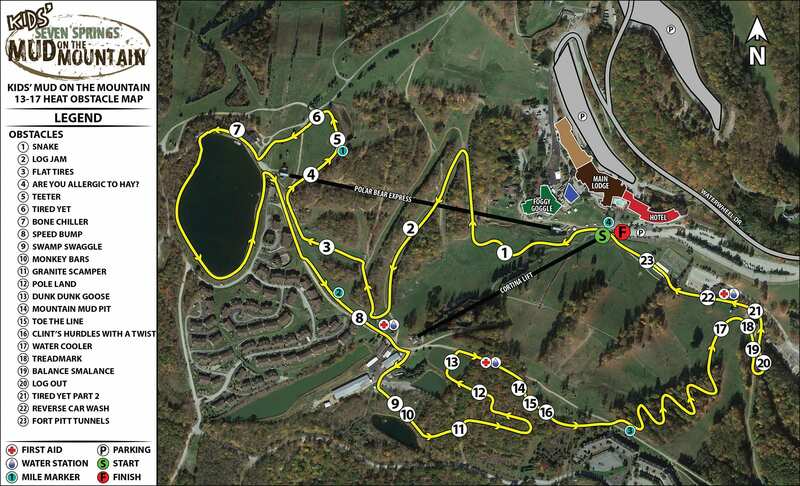 Download the 2019 Mud on the Mountain Map by clicking on the image above. 1. Time to Step Up - Climb over these large steps. 2. Hay Hay Hay! - Hay bales are in your way, make your way over them, Hay, Hay, Hay! 3. Mud Pit at Tyrol Pass - Crawl through this pit of sticky, gooey mud. 6. Water Cooler - Slide down our giant slip and slide. 8. Balance Smalance - Try these balance on these obstacles as water hits you. 9. Log Out - The ultimate endurance test when you are the most tired. Carry a log to a designated spot. 10. Tired Yet - An easy climb over a tire wall. 11. Flat Tires - Work through this tire obstacle with water pouring on you. 12. Reverse Car Wash - Wade through this wall of soap suds as you go through our car wash.
14. Fort Pitt Tunnels - Crawl through these tunnels. it may be a little dark and wet inside. 15. Log Jam - Make your way over these logs and you are just steps away from the finish line! 2. Log Jam - Climb over this pyramid of logs. 3. Flat Tires - Work through this tire obstacle with water pouring on you. 4. Are You Allergic to Hay? - Make your way over our large hay bales. 5. Teeter - Welcome back to the playground except this time you can run up and down the teeter totter. 6. Tired Yet - A wall that is a conglomeration of tires and wood. 7. Bone Chiller - Don't be afraid of the water because it is only thigh deep but it might get cold as you make your way through 70 yards of our version of Lake Tahoe. 8. Speed Bump - An easy climb over a tire wall. 9. Swamp Swaggle - Down in the valley where the green grass grows you will pull or push yourself through this mud pit covered by a fence. 10. Monkey Bars - Back to the monkey bars on the playground but don't slip because you will get wet. 11. Granite Scamper - Over the creek through the woods but watch out for the small boulders and rocks. This isn't a very smooth scamper. 12. Pole Land - “Over and Under”. Are you tired yet? 13. Dunk Dunk Goose -Probably the toughest mental challenge on the course. Going under the barrels in this spring fed lake. When you get out of the water you will feel like Einstein. 14. Mountain Mud Pit - Crawl through this pit of sticky, gooey mud. 16. Clint's Hurdles - Named after our favorite skipper. Just remember what Clint always says, ”Every pitch is a game within a game. Don't take a pitch off.” This 8ft obstacle is that pitch within that game. 17. Water Cooler - Slide down our giant slip and slide. 19. Balance Smalance - Try these balance on these obstacles as water hits you. 20. Log Out - The ultimate endurance test when you are the most tired. Carry a log to a designated spot. 21. Tired Yet - An easy climb over a tire wall. 22. Reverse Car Wash - Wade through this wall of soap suds as you go through our car wash.
23. Fort Pitt Tunnels - Crawl through these tunnels. it may be a little dark and wet inside. Make the most of your Kids’ Mud Weekend with the Kids’ Mud Summer Kickoff Package! Spend the night in our newly-renovated hotel, wake up just steps from the starting line and enjoy All-Day Adventure Passes featuring all-day access to 10+ mountain adventures for your entire stay! Starting at $162 per room based on double occupancy. For more information or to make your reservation, please call (866) 437-1300. Hotel rates are per room, based on double occupancy. Registration to Kids’ Mud on the Mountain is not included in the lodging package. Register here for Kids’ Mud on the Mountain. The all-day adventure pass does not include any add-ons for ziplines, paintball or biking. Hours for activities may change without prior notice. Please refer to the Mountain Courier or the Adventure Report for the most up to date hours. Blackout dates may apply. Advanced reservations are required. Package cannot be combined with any additional discounts, coupons offer or contracted rate. Restrictions apply.